This week is National Infertility Awareness Week! Before I had children, I never realized how many women this affects. 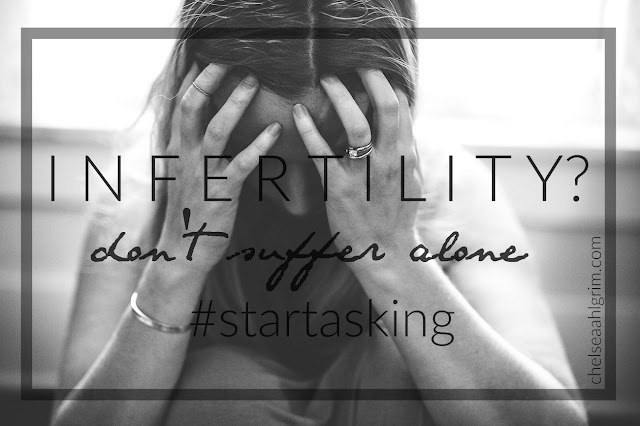 Most of my closest friends and family have had infertility issues and trouble conceiving or staying pregnant. These are not isolated events, but the women experiencing them can feel extremely isolated. My hope in sharing the stories of some of these women below is that it will encourage those suffering, and their friends and family to #startasking the right questions, instead of giving the wrong (and often unwanted) advice. If you'd like more information on how you can get involved, you can visit resolve.org. God bless! It's difficult for me to feel qualified to write to you- me with two happy, healthy, golden-haired babies in the next room. You probably look at me and think that I couldn't possibly understand your pain. No one could... Maybe you struggled only for a short time, as I did. Maybe your journey has just begun. Or maybe you've experienced years of pain and disappointment and even loss. Whatever your story is, you wake up every single day with a stabbing pain of emptiness... something is missing and you don't know why. But you need to know you're not alone. I know. It's easier said than done... when well-intentioned family members keep asking when you're going to have a little bundle of joy and everyone you know is getting pregnant. You smile politely with sad eyes, and buy another baby shower gift. You tell yourself it's just not your turn. But after a while, you start to consider that maybe- just maybe- this is God's way of telling you that you aren't meant to have children. And when you are brave enough to share with others, sometimes it backfires. They're all experts, of course. Because their mother's cousin told them if you'll just RELAX it'll happen. You're thinking about it too much. Have you tried lifting your hips afterward? Clearly you're doing it wrong, and why don't you just adopt? But can I just share with you for a minute? These are only a handful of nearly a hundred stories of women who were gracious enough to share their hearts with me about their own personal struggles with trying to conceive and infertility. Do you see anything to which you can relate? "No one truly understands what it feels like to struggle to conceive. The comments people make can truly break a person's heart. I was told so many different things, "maybe this is God's way of showing you that you shouldn't have kids." Statements people made were hurtful. It is a situation that truly takes up every thought of every day! We become consumed and depressed and it is a struggle to even be a functioning adult at times." "it is painful to get so many baby shower invites. SOmetimes play dates with friends who have 3 or 4 kids is hard to watch. That sometimes I feel like less of a mom with my 1 kiddo. [I wish] that people would rejoice when they find out they are pregnant again with #4 and not roll their eyes or gripe. It is a gift. A precious gift. And it is a real struggle." "Everyone said, " you just need a few hormone shots and then it'll happen"...or " why don't you just don't IVF?" Many don't realize the cost of infertility...we were looking at $15,000 for "treatments" to hope they take in that one shot... It's important to understand that we are not childless because we choose to be, but it's because we are childless that we have to make difficult decisions to be able to create the family we desire... And those decisions are often accompanied with heartache and stress. Many don't understand grieving the loss of a child you never had- but that loss is Oh so painful and we relive it every time we explain why we don't have our own child." "I wish people knew that adoption is not second option or sloppy seconds for us. We, obviously, grieve that we are unable to conceive, but we count it as a massive blessing that our first child will be adopted. Also, there are other things happening in my life. 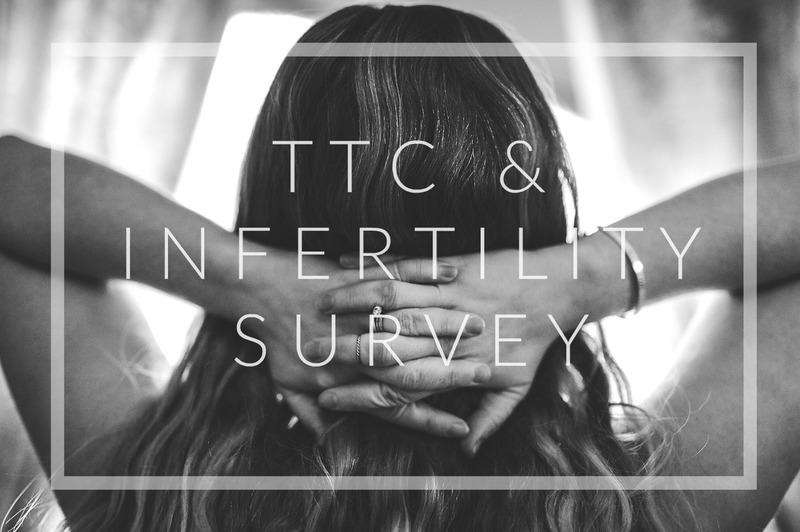 Please talk to me about something other than my infertility or future babies. 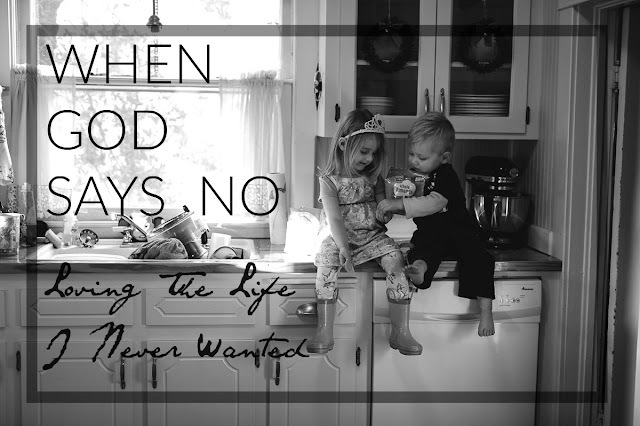 The Lord is good and fulfilling even when I don't have a child." "How exhausting it is. Everyone thinks they have an idea, but unless you have tracked, recorded, timed, watched discharge, medicated, and scheduled, you have no idea how much goes in to it. And you have to do all of that while still trying to keep the fire alive and not make it a "job", even though it really is. You put so much time and effort into wanting it so unbelievably badly, that it does become a job. A job that you love and do your very best at, but can't ever seem to get that raise..."
"I'm terrified to lose friends and family because I don't know what their going through and they'll start to cut me out. And most of all I'm so scared my husband will change his mind about being ok with not having a kid and leave me for someone who can give him what he truly wants. Everyone says it takes time and to be patient and that's easy for them to say because they have no idea the pressure I'm putting on myself." "It hurts my heart so much... And I don't talk about it"
Oh, friend... you're not alone... not by a mile. There are women all around you with the same sad eyes. They carry the same burden on their shoulders. They feel the same pit in their stomachs each and every time they pass a baby in the grocery store. They stare at themselves in the mirror and wonder why... Why me? And they want to feel understood too... So here's what I want you to do. Start asking for hands to hold and reminders that you are MORE than your struggles. Start asking friends and family to get involved. Remind them that you're not looking for advice, you're looking for advocacy. You want support, not suggestions. They love you. They'll understand. If you follow me on Instagram, you might already know this, but I have a child who insists on dressing herself. She goes out wearing all manner of crazy patterns and combinations of dresses over skirts over pants over more dresses. She wears mis-matched socks. With sandals. Or snow boots with a too-big tank top. Hats. Sunglasses. Scarves. It all goes on. And out the door she goes. And somehow she totally owns it. So why do I do this? Why do I allow myself to be seen with a child wearing a backwards snow suit in summertime? I could very easily tell her to turn right back around and go pull something more sensible out of her closet. I could take control over every aspect of her wardrobe and make sure she is only ever wearing the most Pin-worthy Preschool styles. I could force my personal preference of neutrals over her love of bold colors and mixed patterns. But why? Why not give her control over something in her little life? Why not give her the freedom to be her own person and love what she loves? See, I subscribe to the idea that maybe we've become a little too involved in our children's lives... we hover. We nitpick. We intervene on their behalf. We call teachers and argue about grades and we fight their battles for them. And yeah, okay, we love them so we just want the best for them but then? Well, then they grow up and move out and turn into adults who can't think for themselves or handle their business. The can't think critically or problem-solve effectively and they spend their adult lives with their eyes darting to all corners of the sky waiting for someone to swoop in and save them. 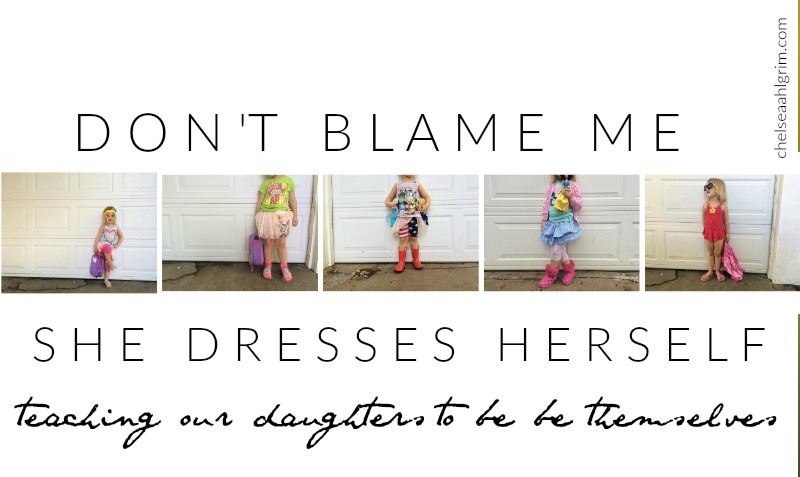 Moms, let's be people that push our daughters to be themselves. And then maybe... just maybe, if we start our girls off on the right foot, when they leave the safety of our nests, they'll know how to keep their heads above water. They'll know they're the masters of their own domain. The captain of their own ship. And they'll march to the beat of their own drum. Hi guys, I need your help. National Infertility Awareness Week is coming up and I have many special women in my lives who have been affected by this struggle. I'd like to honor them by doing a few posts about trying to conceive, infertility, and common misconceptions regarding both. I'd like to use some personal stories, but I know this is a very sensitive issue, so here's what I've done: I created this survey. It's only five questions and completely anonymous. If you are a woman who has children- even if you've never experienced any issues with trying to conceive- please take a minute to fill out this survey and pass it along so others can do the same. It would mean the world to me, and to many other women who might think they are suffering alone. Thanks and God bless. My life is so beautiful... I'm not saying that to brag. I'm simply reminding myself. It's easy to forget sometimes when the laundry piles up and the kids won't listen and the husband travels for work again. Sometimes dinner is cereal in paper bowls for them and a glass of wine and chocolate for me. The bathrooms get cleaned MAYBE once a month... if someone is coming over... and don't even ask the last time that I washed my hair because I will lie to your face (for the record, it's only been three days. Ahem.) Life doesn't always feel beautiful. I don't always feel beautiful. But here's what I know: my life is beautiful. And the only reason I have it, is because God was gracious enough to tell me no. See, this was never the life that I wanted. Can any of you relate to that? My plans were so different. So much "bigger." If you had told sixteen-year-old Chelsea that in fifteen year's time, she'd be married with two kids, a dog, a historic home in a small town, AND she'd be a stay-at-home, homeschool mom, she'd laugh in your face. In fact, she'd probably roll her eyes and insult your shoes too (Sixteen-year-old Chelsea wasn't very tactful). (Also, maybe don't mention that I changed my voter registration to Republican... she'd have an opinion on that for sure...) But here I am. The plan was simple: move to New York and become a famous Broadway actress. I didn't even like kids, and I certainly had no intentions of marrying a man who might make me pop them out. I was going to use the gifts that God had given me to make the Broadway stage my ministry... see how I did that? Why do we do that? We take our plans and try to shove what we think God wants to hear into a box and wrap it up so it looks nice and shiny and well-intentioned... I'm good at that. As you might have surmised, I'm not a famous Broadway actress (although you may have seen me in your local theater's production of "Seven Brides for Seven Brothers" But whatevs). When I think about that life- the one where I was constantly living off of sugar and caffiene and alcohol, having rehearsal until all hours of the evening, then partying into the wee hours of the morning, and working solely for my own glorification, I remember it fondly... it was a fun time in my life... but it is not a life I would want now. So here I am. Sitting here in my old house, sipping green tea, working on homeschool curriculum, avoiding dishes, making googly eyes over the two little blonde babies that I never wanted, while my handsome husband is out working hard for us. It's not a perfect life. But it's mine. It's everything I ever wanted... and I didn't even know it.